FEMA continues to work closely with the states that were affected by the recent wave of severe storms and tornadoes in the Midwest and South. According to USASpending, 279 contracts were already awarded to contractors last week by the agency. Business owners across many industries are urged to prepare for current and upcoming contracting opportunities to aid in disaster relief and rebuilding efforts. In order to qualify for any federal contracts, vendors must obtain a DUNS number and have completed their CCR registration and ORCA filing. 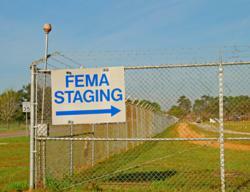 To qualify for FEMA contracts, businesses must also complete a FEMA Vendor Profile. Vendors are also strongly encouraged to complete their Dynamic Small Business Search profile. Failure to complete all these steps prior to bidding may cause costly delays or even result in losing a contract award to another business. The Industry Liaison (IL) Program is the portal for all vendors seeking to do business with FEMA. The IL Program is committed to establishing strategic relationships with industry partners and stakeholders with access to vendors and contractors. Serving as an industry advocate, the IL Program acts as the liaison between vendors and the program offices. During a disaster, the IL Program has created a process to ensure that information about your company's products or services is routed as supplemental market research to the appropriate FEMA contracting and acquisition professionals. While the biggest demands are for debris removal, construction services and emergency supplies, other industries are also needed to help FEMA fulfill its goals. Interested businesses should get registered as soon as possible so they don't miss out on FEMA contracting opportunities. Unfortunately, many vendors who try to complete their CCR registration on their own run into problems. The Georgia Tech Procurement Assistance Center has reported that nearly 20% of all current CCR records contain errors or omissions. To help businesses quickly prepare for FEMA contracts, US Federal Contractor Registration now helps their clients complete the FEMA Vendor Profile, in addition to assisting them with their CCR and ORCA registration. US Federal Contractor Registration's government marketing services include the creation of a Dynamic Small Business Search profile for the vendor as well. To help small businesses avoid costly errors, US Federal Contractor Registration is offering a free evaluation and review of vendors' government registration, including their CCR registration and ORCA filing. During the evaluation, a Placement Specialist will review the company's government contractor registration to ensure it is complete, contains the correct information and is optimized to help them win government contracts. To receive this free evaluation, interested businesses should contact the toll free Contractor Helpline at (877) 252-2700 ext 1. Placement Specialists can also prepare a free government contracting profitability assessment to help business owners review government spending trends within their industry and identify current contracting opportunities. US Federal Contractor Registration is the official third-party registration firm. We offer businesses the option to work with a case manager to complete and maintain their CCR registration and ORCA filing for one year, as well as complete their FEMA Vendor Profile so they can qualify for FEMA contracts. To get more information on FEMA contracts available for your business and request a free FEMA packet, call our Contractor Helpline at (877) 252-2700 ext 1 or visit our website at https://femacontracts.com/.